Today is Allan Birnbaum’s Birthday. Birnbaum’s (1962) classic “On the Foundations of Statistical Inference,” in Breakthroughs in Statistics (volume I 1993), concerns a principle that remains at the heart of today’s controversies in statistics–even if it isn’t obvious at first: the Likelihood Principle (LP) (also called the strong likelihood Principle SLP, to distinguish it from the weak LP ). According to the LP/SLP, given the statistical model, the information from the data are fully contained in the likelihood ratio. Thus, properties of the sampling distribution of the test statistic vanish (as I put it in my slides from my last post)! But error probabilities are all properties of the sampling distribution. Thus, embracing the LP (SLP) blocks our error statistician’s direct ways of taking into account “biasing selection effects” (slide #10). Intentions is a New Code Word: Where, then, is all the information regarding your trying and trying again, stopping when the data look good, cherry picking, barn hunting and data dredging? For likelihoodists and other probabilists who hold the LP/SLP, it is ephemeral information locked in your head reflecting your “intentions”! “Intentions” is a code word for “error probabilities” in foundational discussions, as in “who would want to take intentions into account?” (Replace “intentions” (or the “researcher’s intentions”) with “error probabilities” (or the method’s error probabilities”) and you get a more accurate picture.) Keep this deciphering tool firmly in mind as you read criticisms of methods that take error probabilities into account. For error statisticians, this information reflects real and crucial properties of your inference procedure. The Statistical Science Issue: This is the first Birnbaum birthday that I can point to the Statistical Science issue being out.I’ve a hunch that Birnbaum would have liked my rejoinder to discussants (Statistical Science): Bjornstad, Dawid, Evans, Fraser, Hannig, and Martin and Liu. For those unfamiliar with the argument, at the end of this entry are slides from an entirely informal talk as well as some links from this blog. Happy Birthday Birnbaum! The Weak LP concerns a single experiment; whereas, the strong LP concerns two (or more) experiments. The weak LP is essentially just the sufficiency principle. The argument still cries out for being translated into a symbolic logic of some sort. ……As long-standing as Birnbaum’s result has been, Birnbaum himself went through dramatic shifts in a short period of time following his famous (1962) result. More than of historical interest, these shifts provide a unique perspective on the current problem. Return to where we left off in the opening section of this rejoinder: Birnbaum (1969). On the basis of (Conf), Birnbaum reinterprets statistical outputs from N-P theory as strong, weak, or worthless statistical evidence depending on the error probabilities of the test (1977, 24-26). While this sketchy idea requires extensions in many ways (e.g., beyond pre-data error probabilities, and beyond the two hypothesis setting), the spirit of (Conf), that error probabilities qualify properties of methods which in turn indicate the warrant to accord a given inference, is, I think, a valuable shift of perspective. This is not the place to elaborate, except to note that my own twist on Birnbaum’s general idea is to appraise evidential warrant by considering the capabilities of tests to have detected erroneous interpretations, a concept I call severity. That Birnbaum preferred a propensity interpretation of error probabilities is not essential. What matters is their role in picking up how features of experimental design and modeling alter a methods’ capabilities to control “seriously misleading interpretations”. Even those who embrace a version of probabilism may find a distinct role for a severity concept. Recall that Fisher always criticized the presupposition that a single use of mathematical probability must be competent for qualifying inference in all logical situations (1956, 47). Birnbaum’s philosophy evolved from seeking concepts of evidence in degree of support, belief, or plausibility between statements of data and hypotheses to embracing (Conf) with the required control of misleading interpretations of data. The former view reflected the logical empiricist assumption that there exist context-free evidential relationships—a paradigm philosophers of statistics have been slow to throw off. The newer (post-positivist) movements in philosophy and history of science were just appearing in the 1970s. Birnbaum was ahead of his time in calling for a philosophy of science relevant to statistical practice; it is now long overdue! “Relevant clarifications of the nature and roles of statistical evidence in scientific research may well be achieved by bringing to bear in systematic concert the scholarly methods of statisticians, philosophers and historians of science, and substantive scientists” (Birnbaum 1972, 861). Mayo, Deborah G. On the Birnbaum Argument for the Strong Likelihood Principle (with discussion & rejoinder). Statistical Science 29 (2014), no. 2, 227-266. Mayo, Deborah G. On the Birnbaum Argument for the Strong Likelihood Principle. Statistical Science 29 (2014), no. 2, 227-239. Dawid, A. P. Discussion of “On the Birnbaum Argument for the Strong Likelihood Principle”. Statistical Science 29 (2014), no. 2, 240-241. Evans, Michael. Discussion of “On the Birnbaum Argument for the Strong Likelihood Principle”. Statistical Science 29 (2014), no. 2, 242-246. Martin, Ryan; Liu, Chuanhai. Discussion: Foundations of Statistical Inference, Revisited. Statistical Science 29 (2014), no. 2, 247-251. Fraser, D. A. S. Discussion: On Arguments Concerning Statistical Principles. Statistical Science 29 (2014), no. 2, 252-253. Hannig, Jan. Discussion of “On the Birnbaum Argument for the Strong Likelihood Principle”. Statistical Science 29 (2014), no. 2, 254-258. Bjørnstad, Jan F. Discussion of “On the Birnbaum Argument for the Strong Likelihood Principle”. Statistical Science 29 (2014), no. 2, 259-260. Mayo, Deborah G. Rejoinder: “On the Birnbaum Argument for the Strong Likelihood Principle”. Statistical Science 29 (2014), no. 2, 261-266. 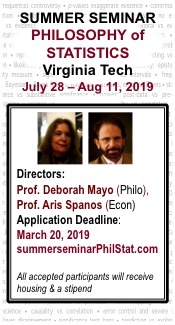 Abstract: An essential component of inference based on familiar frequentist notions, such as p-values, significance and confidence levels, is the relevant sampling distribution. This feature results in violations of a principle known as the strong likelihood principle (SLP), the focus of this paper. In particular, if outcomes x∗ and y∗ from experiments E1 and E2 (both with unknown parameter θ), have different probability models f1( . ), f2( . ), then even though f1(x∗; θ) = cf2(y∗; θ) for all θ, outcomes x∗ and y∗may have different implications for an inference about θ. Although such violations stem from considering outcomes other than the one observed, we argue, this does not require us to consider experiments other than the one performed to produce the data. David Cox [Ann. Math. Statist. 29 (1958) 357–372] proposes the Weak Conditionality Principle (WCP) to justify restricting the space of relevant repetitions. The WCP says that once it is known which Ei produced the measurement, the assessment should be in terms of the properties of Ei. The surprising upshot of Allan Birnbaum’s [J.Amer.Statist.Assoc.57(1962) 269–306] argument is that the SLP appears to follow from applying the WCP in the case of mixtures, and so uncontroversial a principle as sufficiency (SP). But this would preclude the use of sampling distributions. The goal of this article is to provide a new clarification and critique of Birnbaum’s argument. Although his argument purports that [(WCP and SP), entails SLP], we show how data may violate the SLP while holding both the WCP and SP. Such cases also refute [WCP entails SLP]. Regular readers of this blog know that the topic of the “Strong Likelihood Principle (SLP)” has come up quite frequently. Numerous informal discussions of earlier attempts to clarify where Birnbaum’s argument for the SLP goes wrong may be found on this blog. [SEE PARTIAL LIST BELOW. [i]] These mostly stem from my initial paper Mayo (2010) [ii]. I’m grateful for the feedback. Midnight with Birnbaum (Happy New Year). New Version: On the Birnbaum argument for the SLP: Slides for my JSM talk. Don’t Birnbaumize that experiment my friend*–updated reblog. Allan Birnbaum, Philosophical Error Statistician: 27 May 1923 – 1 July 1976 . Putting the brakes on the breakthrough: An informal look at the argument for the Likelihood Principle. Mayo, D. G. (2010). “An Error in the Argument from Conditionality and Sufficiency to the Likelihood Principle” in Error and Inference: Recent Exchanges on Experimental Reasoning, Reliability and the Objectivity and Rationality of Science (D Mayo and A. Spanos eds. ), Cambridge: Cambridge University Press: 305-14. Birnbaum, A. 1962. “On the Foundations of Statistical Inference.” In Breakthroughs in Statistics, edited by S. Kotz and N. Johnson, 1:478–518. Springer Series in Statistics 1993. New York: Springer-Verlag. *Judges reserve the right to decide if the example constitutes the relevant use of “intentions” (amid a foundations of statistics criticism) in a published article. Different subsets of authors can count for distinct entries. No more than 2 entries per person. This means we need your name. “A significance test inference, therefore, depends not only on the outcome that a trial produced, but also on the outcomes that it could have produced but did not. And the latter are determined by certain private intentions of the experimenter, embodying his stopping rule. It seems to us that this fact precludes a significance test delivering any kind of judgment about empirical support… For scientists would not normally regard such personal intentions as proper influences on the support which data give to a hypothesis”. Howson and Urbach, 1989, p. 171). (Scientific Reasoning: The Bayesian Approach, Open Court). I hope that’s good enough. Yes, the fallacy here is one I bring out in EGEK (someplace*). Essentially all inference specifications are “determined by the experimenter’s intentions”(e.g., to study one thing rather than another, to use telescopes with such and such properties, sample humans, monkeys, etc) but it doesn’t follow that “taking account of those specifications” is merely to take account of “intentions”. *Here it is, chapter 10, pp 346-7.
e.berk (1): Of course you’d know that one as a former student–and it’s a perfectly legitimate example of the kind of “argument from intentions” I had in mind. So it counts. space can greatly affect the p-value. …. Yes, mere consistency doesn’t suffice for the error statistician. The altered sample space is scarcely trivial, but corresponds also to an altered sufficient statistic and error probing capacity. Interestingly, nonsubjective (conventional) Bayesians (which I think makes up the predominant group of Bayesians these days–even though there are different tribes, and they disagree with eachother), are prepared to allow their priors to depend on the sample space. Subjective Bayesians (rightly) object that this is incoherent behavior. But J. Berger says it’s necessary for “objectivity”. Yet, ironically, this still doesn’t obviously bring them into error statistical territory (except possibly for “frequentist matching” priors). This remains an open question for other stripes of Bayesians. J.Berger does admit this, and even concedes this can lead to 95% HPD intervals always excluding the true value (e.g, Berger and Wolpert). However, I seem to recall some Bayesians giving a special definition to a case of “sampling to a foregone conclusion” such that the allowable cases (bad as they are) don’t fall under that umbrella. No time to check, but it’s somewhere in the book jointly authored by Kadane, Shervish, Seidenfeld. I believe those cases are akin to those where the alternative hypothesis is predesignated, but might have this wrong. J.A.W. Thanks much. Since I had stipulated (see *, the small print at the bottom of the post) only 2 per person and you’ve gone beyond this, I will let others have a shot at this (though I may post your others once the 30 examples are reached). Don’t forget to send me info for receiving the award. I hadn’t heard of this author before. Yes, it’s amazing how much staying power that logical positivist idea that there is a logical relationship between any given data and hypothesis, and the “data should speak for themselves” and you shouldn’t need to know how they were collected or how the hypotheses or test rule was formulated. Popper recognized long agao–a central reason for his rejecting logical positivism–that there was a conflict between this idea-that there’s “a logic of evidential relationship” –and our intuitions that ad hoc data, non-novel data, double counting data, etc are pejorative. The question for the Popperians was: where do we place this extra information? Popper placed it under “novelty” or “severity” but never identified a clear notion, nor did his followers. Lakatos, also a follower, proposed they belong under “historical” or “discovery” considerations. So the idea that you couldn’t have an account of evidence and testing without historical considerations was born. But they never had a satisfactory notion of which parts of history matter. Still, the Lakatosian idea, that it is relevant to consider the history by which a hypothesis or theory was propped up by worm-eaten stays to avoid falsification, was in the right spirit. Johansson T (2010) “Hail the impossible: p-values, evidence, and likelihood.” Scandinavian Journal of Psychology 52:113-125. Jean: I never heard of this person, it’s amazing how they all repeat the earlier slogans. I wonder what “first-third’ were, and maybe there’s a fifth or a sixth. Can you please link to the source? “Where, then, is all the information regarding your trying and trying again, stopping when the data look good, cherry picking, barn hunting and data dredging” the terminology is too broad – many of these characteristics can be modeled as conditioning or selection effects which can be modeled probabilistically. I see intention as a separate issue from biased selection bias. Intention relates to for example, what constitutes the space of comparisons to be incorporated into a multiple comparison adjustment which I have _never_ heard a defensible answer to. Once you adjust for multiple comparisons within an experiment, do you adjust for all the studies happening in the field? Do you adjust for all comparisons in all of science? pre-registration has similar issues with subjectivity. These concepts do real harm – scientists are afraid to look at data because they don’t (instead of simply modeling the base rate). Furthermore the same multiple comparison adjustments that “seemed” to filter out bad results because they were calibrated for the base rate suddenly don’t work anymore once the power of the study increased. As for the LP, as an applied practitioner I kind of shrug along with larry wasserman regarding foundations. What matters most to scientists and applied practitioners is risk (in a decision theoretic sense). VL: “I see intention as a separate issue from biased selection bias. ” I do too. As for when to adjust, see my defn of “biasing selection effects” in the slides for the previous post. Figuring out a precise adjustment is not essential—holding you accountable for reporting an unvalidated error probability is. We don’t give up on making important distinctions simply because there may be ambiguous cases, or because a prima facie concern may be defeasible in a particular case (which severity specifically allows). David:Thanks for the quote. I see that Wagenmakers was cited before, but since it’s in a different group of authors, it counts. However I need the link. I want to make two comments, for the general reader (not directed at you, but the author): First,It is not true that the sampling plan must be specified in advance; sequential testing (to name just one example that comes up in relation to “intentions”) is relative to when it stops. Nor are error statisticians incapable of detecting violations in assumptions post data. my answer is, well isn’t it just too bad that “fewer people would adjust their p-values”? We are free to deny their results are warranted, and to suggest to them that they are enabling, rather than helping to stem, biased selection effects. They are free not to indicate what they’ve done when the data turned out not to be nominally significant after the first inspection, and we are free to discount their results! Failure to be able to assess severity, even approximately, counts as low/poor severity. > A naive student of Bayesian inference might claim that because all inference is conditional on the observed data, it makes no difference how those data were collected. This misplaced appeal to the likelihood principle would assert that given (1) a fixed model (including the prior distribution) for the underlying data and (2) fixed observed values of the data, Bayesian inference is determined regardless of the design for the collection of the data. Under this view there would be no formal role for randomisation in either sample surveys or experiments. The essential flaw in the argument is that a complete definition of ‘the observed data’ should include information on how the observed values arose, and in many situations such information has a direct bearing on how these values should be interpreted. Formally then, the data analyst needs to incorporate the information describing the data collection process in the probability model used for analysis. Surely you know that randomization has long had a very uneasy and awkward life in Bayesian inference, especially for subjective Bayesians (see Wasserman, Kadane for 2 off the top of my head). It certainly isn’t required, and most importantly, doesn’t play the 3 roles it does in frequentist inference. The best argument is along the lines of enabling the posterior to be less sensitive to the prior. If I weren’t dashing, I’d look up references. I think Gelman-Bayesians should add an error statistical dimension to their accounts, rather than beating around the bushes. Randomization doesn’t have anything to do with sensitivity to the prior, it comes in w.r.t. to conditioning and causal identifiability. It’s certainly valid to do a bayesian analysis without randomization, but then what’s estimateddoesn’t map to the target causal parameter. randomization decorrelates the conditioning of the observations with any confounders. Thus for Bayesians randomization vs. observational data is a relevant distinction in the way that choosing a scale vs. a thermometer for measurements is a relevant distinction for weighing a baby. In both cases, the measurement and object of interest need to be matched. I don’t see anything “awkward” this relationship. Certain aspects of how the data arose may of course be relevant to affirming the model (for a non-subjective Bayesian). Trying to get this into a justification for randomization is a stretch, but the point is, how are these properties used in the inference account? How does such information actually have bearing in the formal account (not just that someone thinks it ought to). In general, error probabilistic properties do not appear if inference is by Bayes theorem. One cannot just pronounce something, one needs a principled justification for where error probabilities of the method make a difference–if you think it should. Bayesians have been happy as claims that they do NOT deal in error probs because of their repeated sampling justification. Gelman is an error statistician, at least on Saturday, Monday, and Wednesday. Well I’m not one to say whether Gelman is an error statistician or not, and I’m sure there are many interesting questions concerning nailing down the formal philosophical stance of something like ‘Gelman-Bayes’ (Box-Rubin-Gelman-Jaynes-Bayes?). I do think it would be a stretch to include Gelman-Bayes under error statistics proper – beyond certain Popperian influences and desire to check models – due to the central role of regularization and (weakly?) informative priors and the eschewing of concepts like type I/II errors, power etc. But I’m sure it could be interesting to examine the formal basis of the approach while sticking as close as possible to how it operates in practice. Without a detailed account of the latter though, I’m not sure the former would be easy to work out. Regarding the topic of the post more specifically – it is interesting how these ‘howlers’ are repeated so often, and worthwhile to call them out. Unfortunately I think this focus also takes away from either ‘side’ investing more effort in the more interesting arguments and approaches (such as Gelman-Bayes, or even Bernardo and Smith). Most of the arguments about the likelihood principle – while interesting – seem orthogonal to the perspective of something like Gelman-Bayes. It may be naive, but I find it helpful to think in terms of ‘your model for the data should represent (models for) all the relevant processes generating your data’ and that many issues to do with the likelihood principle either concern a misspecified or ill-defined model (where ‘model’ for a Bayesian includes the prior component) or a bias-variance trade-off for point estimates related to things like a paucity of data that could be addressed by e.g. inspecting the posterior (or likelihood) as a whole. An interesting topic relevant for the error statistician, though, is how Bayesian inference behaves under misspecification in practice. How is it identified, fixed etc etc. There seems to be some quite interesting mathematical work on this topic. I went to a nice presentation by Peter Grünwald last week on this. I enjoyed his ‘geometry of misspecification’ perspective. Also related would be the work on ‘Bayesian brittleness’ you’ve mentioned before. In general though, these involve taking Bayesian inference seriously as an interesting modelling paradigm and investigating its performance under challenging conditions. 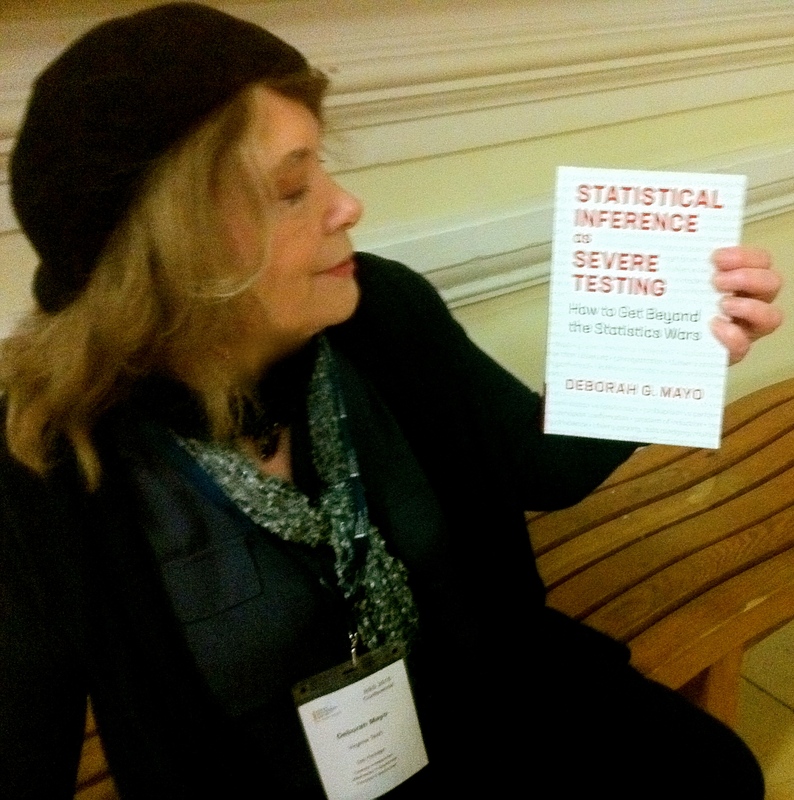 While Gelman has been inspired by some of Jaynes’s writings, he’s not in the Cox-Jaynes school of thought on statistical foundations, so “Gelman-Jaynes-Bayes” isn’t really a thing. Fair enough re: Gelman-Jaynes-Bayes. I mainly meant that, while I appreciate and have learned a lot from Gelman’s approach, is also misleading to imply he is somehow especially unique in his views – there’s actually a pretty common subset of Bayesians with similar views. Really? Who reject inference as updating probabilities by Bayes theorem, and deny subjective and conventional priors, and reject Bayes factors, but test models/priors using his form of predictive distributions (using sampling distributions)? Posterior predictive distributions are also pretty Bayesian creatures. Even Bernardo and Smith present a predictive Bayes approach that is operationally pretty similar but with all the subjective terminology baggage. PS This time I’m the one on a train and dashing! George Box advocated an eclectic approach combining frequentist “criticism” and Bayesian “estimation”, but the foundational picture isn’t very clear. His model checking work also inspired non-Bayesian model checking. But I was assuming you had in mind a much more pervasive approach, or is Bayesianism really that fragmented these days? Hmm well Gelman’s book has 6 or so authors and seems to sell pretty well so I imagine it’s not a minority view? But yes, I’m sure foundations haven’t kept pace with practice. Eclecticism seems popular among general users, but other’s have also reinterpreted and built on people like Box’s ideas to bring them more fully under the Bayes umbrella. I don’t consider myself a gelman bayesian (I’m not even sure what that means), although I’m heavily influenced by his methods and writings on multilevel models. For example, for the life of me I can’t understand what he’s getting at with the “garden of forking paths” business beyond that _everyone_ can _always_ be accused of violating multiple comparisons and weakly powered studies are bad. For me the issue comes down to my accepting that some aspect of the formal account of statical interpretation is extra-statistical. Model mis-specification is one of those things. There are ways of having a probabilistic model over models in bayesian inference, but at some point in the hierarchy you do have to stop. I do find the causal graph formalism that Judea Pearl and Clark Glymour useful in conceptualizing the conditioning of data. Thus I view randomization from this perspective of detatching a variable so that it’s variation is exogenous (as economists like to say) to a system. In my view I’m not trying to ‘stretch’ bayesianism to encompass this, I see it as neither a bayesian nor frequentist consideration, but in the realm of causality, conditioning, and model misspecification. I think you said yourself in another thread that the issue of confounding was a deeper than the statistical accounts? Randomization is closely related to confounding in this view. VL: I’ll respond once I’m finished traveling tonight/tomorrow. I actually like the garden of forking paths as a struggle to eek out an error statistical criticism. I don’t think there’s any question that the garden of forking paths is an error-statistical criticism. Gelman’s whole point is that frequentist methods do not have the advertised error probabilities when researchers decide which methods to apply after examining the data. But it seems to me that Spanos’s misspecification testing (as described in the ‘Intro to Misspecification Testing’ sequence of posts) is vulnerable to a garden of forking paths criticism. I’m thinking in particular of part three, in which he graphs the residuals after removing the time-trend and writes to the effect of, ‘to the trained eye, these data show Markov dependence’ and then does some testing that he leaves out for conciseness and declares in part four that, indeed, a model with Markov dependence is statistically adequate. I don’t think the example Spanos shows is particularly problematic; but what would be problematic is if the data are somewhat ambiguous such that ‘trained eyes’ might or might not perceive Markov dependence. What then could we conclude about the actual error probabilities of formal MS tests? Since I’ve been ay, I may be picking up in the middle of things. That error statistical guarantees are directly violated by cherry-picking, data-dependent hypotheses, multiple testing, optional stopping was PROVED by frequentist founders ~80 years ago. I don’t see such a demonstration in Gelman’s forking paths, rather than an intuitive, informal description of how easy it would be to get statistically significant results often, rather than rarely. For probabilists who accept the likelihood principle, such concerns disappear and merely reflect “intentions”. Gelman should make his error statistical concerns explicit. I think m-s testing has some differences from “primary” hypothesis testing . (Mayo and Spanos 2004, and much more in Spano). One is generally not making a statistical inference (to a generalization) and needs only good error properties as regards the inference reached (about the model assumption). I also don’t think that regarding a model as adequate wrt a given assumption is the same as claiming it’s precisely met or some such thing (fallacy of acceptance point). The inference should be to something like, the model is adequate for reliably asking the primary statistical questions. There needn’t be uniqueness. Where is the identification of discrepancies from the null that can and cannot be ruled out? How is this not a pristine example of the fallacy of acceptance? What you’re missing is that “going where the data take you” can be to a very reliable place. They key is to distinguish types of data dependencies (what my work has been about for years). Once there, the adequate model is a platform for making the primary statistical inferences.But maybe I’m missing your gripe. And my question is: where in Spanos’s example analysis is the identification of discrepancies from the null that can and cannot be ruled out that Mayo has asserted is necessary to avoid the age-old fallacy of acceptance? I cannot put it more plainly than that. I’m not sure if you’re responding to me or Mayo, but I (broadly) agree with all of your points (as usual, it seems). What do you think Dr. Bloggs should do?… At this point the audience divides in two. Half the audience intuitively feel that the stopping rule is irrelevant, and don’t need any convincing that the answer to exercise 37.1 (p.463) is ‘the inferences about [the coin’s bias] do not depend on the stopping rule’. The other half, perhaps on account of a thorough training in sampling theory, intuitively feel that Dr. Bloggs’s stopping rule, which stopped tossing the moment the third b appeared, may have biased the experiment somehow. David Mackay, Information Theory, Inference, and Learning Algorithms, pp 462-4. The % of the audience who thinks one way or another is irrelevant. The difference between the Binomial and negative Binomial is generally trivial, but I am not moved by arguments that one could model what he did in a different way, and the audience can have different feelings. The sufficient statistics of these two differ, and different warranted inferences ensue-perhaps trivially different here. We care about principled statistical reasoning, and the fact there can be ambiguous cases—this isn’t one of them–does not mean I give up on the distinction. Jean: Thanks for this. I see no reason to bar ex-students from earning $ for good quotes. There’s one thing you left out though, unless I missed it: Savage declared that he himself was uncomfortable with the “argument from intentions”. I see that on EGEK p. 347, I don’t have an exact quote…but I think I may have that slender volume even here in NYC, I’ll check. But I’m curious, and will almost surely never know the answer, as to why Savage was uncomfortable with the argument. I’m guessing it’s because of the point I had made, namely that almost all specification could be regarded as determined by one’s intentions. Or maybe even more strongly, the “intentions” thing was always a ruse: there are concrete reasons that those error probability considerations do not show up in the Bayesian inference (I’m not saying other ones might not show up, but that’s another story). LIkewise there are concrete reasons that they make a difference to the error statistical inference. It’s not that we’re making inference turn on things that could have but didn’t happen, as they like to say. It’s rather that by considering things that could have but didn’t happen, we are able to ascertain something about the error probing capacities of the tool or method. I know that in my daily life I always scrutinize the particular result of a method by by considering the method’s general probative capacities, and these sampling distributions (in the formal context of statistics) are analogous to what I need to know. But it has taken me awhile to get really clear on this, I’m not saying it’s obvious at first. Certainly it’s more subtle than what you get on an E-R logic–but the logicists are wrong to think there’s a useful “logic” for ampliative inference.